In Science in the New Age, David Hess explores ideologies of the paranormal in the United States. He offers a map of the labyrinth of views put forward by parapsychologists and skeptical debunkers, spirit channelers and crystal healers, Hollywood poltergeist scripts, and prophets of the New Age. Adopting a cultural perspective, Hess moves beyond the question of who is right or wrong to the cultural politics of how each group constructs its own boundaries of true and false knowledge. Hess begins by looking at each group’s unique version of knowledge, science, and religion and at its story about the other groups. Comparing the various discourses, texts, writers, and groups as cultures, he shows how skeptics, parapsychologists, and New Agers may disagree vehemently with each other, but end up sharing many rhetorical strategies, metaphors, models, values, and cultural categories. Furthermore, he argues, their shared “paraculture” has a great deal in common with the larger culture of the United States. 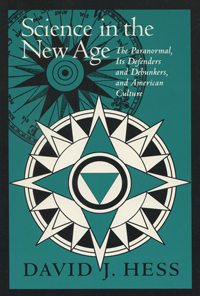 The dialogue on the paranormal, Hess concludes, has as much to do with gender, power, and cultural values as it does with spirits, extrasensory perception, and crystal healing. David J. Hess is associate professor of cultural anthropology in the Department of Science and Technology Studies at the Rensselaer Polytechnic Institute. He is the author of Spiritists and Scientists and coeditor of Knowledge and Society Vol. 9: The Anthropology of Science and Technology.